Preparation Methods & Dosage :Garlic can and should be used liberally in food, either powdered or freshly chopped. Two cloves or more a day are considered a medicinal dose. Eating 2 to 3 fresh garlic cloves a day has many health benefits including diabetes, arthritis and heart health. To make it more palatable, mash the garlic cloves with a spoonful of honey A simple garlic based broth may be more effective than chicken soup! Garlic and it's close relatives (chives, leeks and onions) can be applied directly to burns in a poultice. Or cut an onion in half and squeeze the juice on the burn. 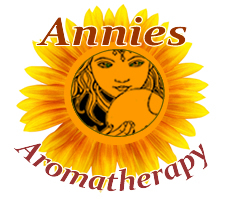 Garlic infused oils can be used topically or in cooking. Crushed garlic is a good addition to any homemade insecticide spray. Garlic cloves, placed in the ground around plants will deter slugs. Garlic is a natural pesticide against mosquito larvae. Ayurvedic Medicine Ransoon , meaning lacking one taste ( sour), works on all tissues. Garlic is a very popular herb in Indian medicine for many disorders and as a general tonic. Garlic Side Effects: Can cause a skin rash in sensitive people. Over consumption can cause heartburn and gas. Moderation is the key here. Garlic is a member of the Allium genus, a branch of the lily family that also includes hundreds of varies of onions, leeks, chives, and shallots. The differences between garlic and onions is in the bulbs and leaves. While garlic produces heads that a divided into sections, (cloves), onions produce a single multilayer globe. Garlic leaves are flat and almost grass-like, while onions tend to be hollow and erect. Shallots fall somewhere in between. Garlic is a easy and fun plant to grow. It requires lots of sun and good, organic rich compost to thrive. 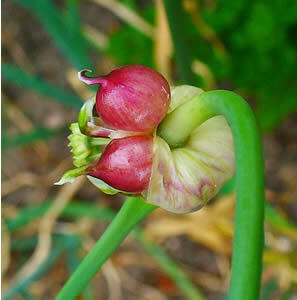 Plant garlic cloves with the pointy side up and set them about 1 inch deep with 3 to 4 inches of room between plants. Garlic is planted in the fall in southern climates for a spring harvest, in the North, plant cloves in early spring for a fall harvest. There are many regional varieties to suit your climate and taste. Related Species Leeks, Allium ampeloprasum var. porrum (L.) This onion like plant has a tender core that may be eaten in soups and salads. Garlic was placed by the Greeks on the piles of stones at cross-roads as a supper for Hecate, and according to Pliny, garlic and onion were invocated as deities by the Egyptians at the taking of oaths. Maud Grieve. "A Modern Herbal" Harcourt, (1931) Garlic formed the principal ingredient in the 'Four Thieves Vinegar,' which originated, it is said, with four thieves who confessed, that whilst protected by the liberal use of aromatic vinegar during the plague, they plundered the dead bodies of its victims with complete security. Steven Foster and Yue chongxi. "Herbal Emissaries" Healing Arts Press, (1992) The relationship of garlic to cardiovascular disease includes the blood pressure-lowering effect of garlic in hypertension, effect on blood thinning and lowering of serum triglyceride and cholesterol levels. Linda B. White, M.D.. "The Herbal Drugstore" Rodale, (2003) Garlic and its cousin onion contain substances that discourage platelets from sticking together and prevent blood clots. They also lower total cholesterol and triglycerides, another type of blood fat, all the while increasing HDL, "good cholesterol". Linda B. White, M.D.. "The Herbal Drugstore" Rodale, (2003) Garlic and onions, these allium family members have long been used to treat bronchitis, allergies and asthma. The ingredients responsible include mustard oils and quercetin. Linda B. White, M.D.. "The Herbal Drugstore" Rodale, (2003) Safe and effective taken over time, garlic's power to kill roundworm, pinworm, tapeworm, and hookworm has been confirmed by scientific studies.